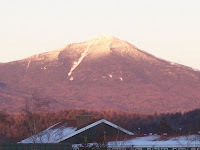 Whiteface, the Olympic Mountain here in the Adirondacks, is in great shape. Skiing was delightful yesterday. The weather cooperated and delivered a sunny, blue bird day. We could see all the way to Vermont from the top of chair 6, the summit chair. The staff deserve another tip of the tuque for all the hard work keeping things well-groomed and in outstanding condition for 'civilian' skiers, while at the same time creating and maintaining a World Cup Freestyle mogul course. The Nature Valley FIS Freestyle World Cup starts tomorrow and runs through the weekend. The best freestyle skiers in the world were there training yesterday, all decked out in their cool outfits with the ski-better magic knee patches. It was very interesting and fun to watch them barrel through the course. Because I live here, I was able to have a lovely time skiing, but still to get back to my office in time to do some work. If you are thinking about how you could live in America's playground and still run a business or work, please contact me. I am a real estate agent and business broker here in Lake Placid at the Prudential Terry Horrocks Real Estate Agency and I can help you make that dream come true. We have come great residential and commercial properties available, and I can even help you own your own business!